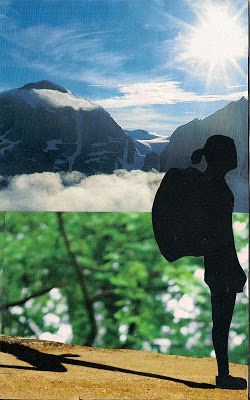 My “Happy Hiker” soul collage. Today I got the opportunity to do something pretty darn cool and I wanted to share it with everyone. I got to make my first soul collage. This is a new concept to me and I think it’s most often done during times of transition or questioning. My good friend Jennifer (who joined me for 100mi on the PCT and may appear again on the CDT) is moving away and making a lot of changes. She had done a soul collage before and suggested it as an activity for us to do as she prepares to leave. We were fortunate enough to get a private session from someone who has been trained to lead people through soul collages and has a great deal of images to work from. Lately, I have been acutely aware that I am insanely happy. Just deep, breath of fresh air, light on my feet, energized HAPPY. I have the trail to thank for this and I know I’m lucky to have found what makes me so happy. I went into this project intent on capturing the happiness. I knew I wanted an image of what I picture to be the Continental Divide Trail. My top image of the sun over the mountains above the clouds immediately struck me. Views like these send jolts of euphoria through my veins all the way to my fingertips. Just as I get energy and excitement from the expansive views, I find calm and peace in the woods with dirt trails and running streams. I feel most centered when I am walking in the woods among the green leaved trees, so it is nice to have them centered in the collage. I was lucky to find a silhouette of a hiker that I was able to trim to more resemble myself. You’ll notice I got my shadow in there on the dirt trail and that just makes me smile. Those who follow my journal know I like photos of my shadow, and if you look closely at this one, you’ll see I cut it from another image of a female runner. I absolutely love this small detail because hiking has filled the space I previously used for running. As I’ve increased my hiking, my running has decreased significantly. Whereas I previously needed to pound my body relentlessly to relieve stress or induce sleep, I now have the less punishing hiking. I also like to point out that the “runner’s high” that I would get from time to time is what I feel when I’m backpacking. So the shadow is showing that I may be hiking, but I feel the euphoria I get when I’m running. I have never heard of a soul board but, as a former art major and counselor, I can relate to it's value. Now I am transitioning to retirement and am looking back on my life experiences and looking forward to an exciting future free to be me re-framed in a new picture. You have given me a new tool in mapping my future, thank you! I'm happy to spread the word. I first thought it would be too corny and not my thing and now having that image hanging on the wall where I can see it everyday is really motivating and inspiring.